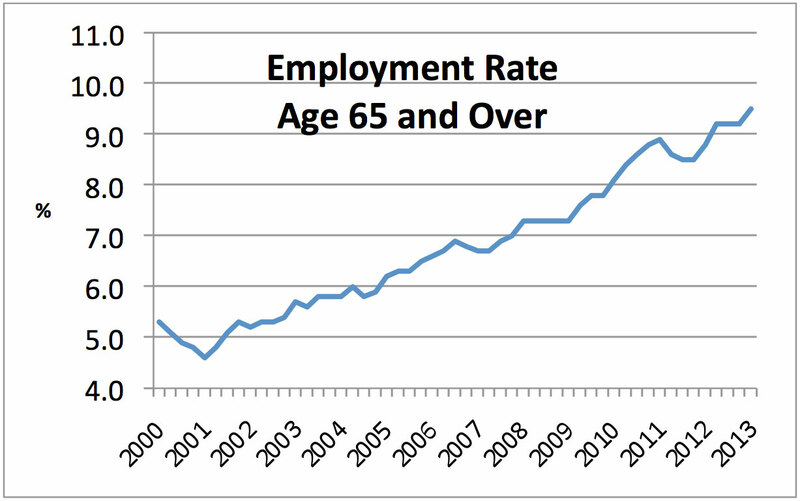 The number of people aged over 65 in work has reached a new record. There are now over one million people in work aged 65 or over according to the latest statistics from the ONS. That represents nearly one in ten of the 65 and older population – more than double the proportion at the start of 2001. As the graph shows, there has been a steadily rising trend, seemingly immune to the vagaries of the UK economy since the turn of the millennium. ONS attributes the breaching of the one million threshold to more people staying on in work and also more people of this age group in the population (the first tranche of the post-war baby boomers is now 65+). 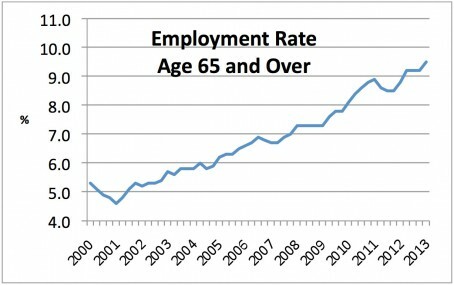 The abolition of 65 as a statutory retirement age, which took full effect in October 2011, has probably also helped boost the in-work numbers. ONS does not define the proportion of the 65+ workers whose financial situation means that they have no alternative to continued employment, even if it is generally part time. The generation now retiring is often thought of as the lucky ones because their working life coincided with the era of final salary pensions, but that is something of an oversimplification. Final salary schemes were not the province of small employers, nor were those in self-employment able to benefit.